Up until 10 weeks ago I’ve always judged my health by the number staring back at me on the scales. If someone had of said to me 10 weeks ago that I would win a 10 Week Transformation Challenge by losing only 1.8kg I would have never believed them. I would have never believed that I would go from being in the worst shape I’ve ever been in to the best shape I’ve ever been in, with just a 1.8kg weight loss - but that’s because I didn’t understand the importance of fat v muscle composition. I lost 5kg of fat (7.7% of body fat) and gained 1.9kg of muscle - understanding my own body composition and working hard to turn around those 2 figures alone has delivered a powerful result. I've always been a member of mainstream gyms with the intention of getting more experience and confident in using weights, but I've always reverted back to cardio as it's less intimidating and comes easier to me, so I usually waste a lot of money on gym memberships because I end up running at home. I have engaged more trainers than the number of months in a year I’d say! But each well intended partnership to help me fulfil my strength goals has failed. I've always just felt like a number to PTs in mainstream gyms, and once I'm out of sight I'm out of mind - so their programs have always been whatever suits on that day rather than developing and delivering a long term program that gives me the best possible opportunity to achieve my individual goals. I’ve been training with Mike for over a year now and can say with absolute conviction that I would be half the person I am now without him. I would still be going for my runs and eating next to no protein and still wondering why on earth my body isn’t changing. He has all the qualities all of my previous trainers have lacked. Mike has been genuinely invested in my journey and having someone come along for the ride means I’ve never felt alone, unsure or overwhelmed or lacking in motivation - all reasons my previous training ambitions have failed. Mike has taken the time to understand who I am, where I’ve come from and where I want to be. And that has made all the difference in the way he has developed, delivered, pushed and encouraged me through each session. 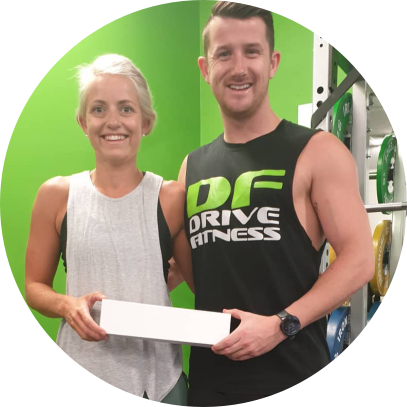 My PT sessions with Mike are what makes me keep coming back every single week but I have also, so much, enjoyed participating in the Drive Fitness boot camps. I wanted to step up my training when I hit the 5 week mark of the 10 week challenge to make sure I didn’t plateau - both physically and mentally - so I joined a couple of sessions a week on top of my studio sessions with Mike. The hour long circuit and boxing classes are fantastic value for money and the classes are set up so that the exercises are tailored to your own individual ability. Everyone genuinely wants each other to succeed without being in competition with one another. Being new to the group I was absolutely taken back by how friendly and inclusive everyone is. I always leave feeling I’ve given 110% which is an extremely satisfying feeling. And when you feel satisfied it drives you to want to come back again - safe to say I quickly became addicted!! After having 3 kids in 3 years I found myself living almost a new life. Raising a 3, 2 & 1 year old, running a house hold and working part time I was suddenly more time poor than I could have ever imagined. I needed to make significant but sustainable change in my exercise and eating habits but I lacked the time, understanding and application to do it on my own. The 10 Week Transformation Challenge gave me all the tools I needed to make these changes. I now understand why it’s so important to integrate weights and strength training into your lifestyle, I have the confidence and knowledge to do my own home workouts, I am able to track my food and calorie intake and understand now what all the fuss is about protein!